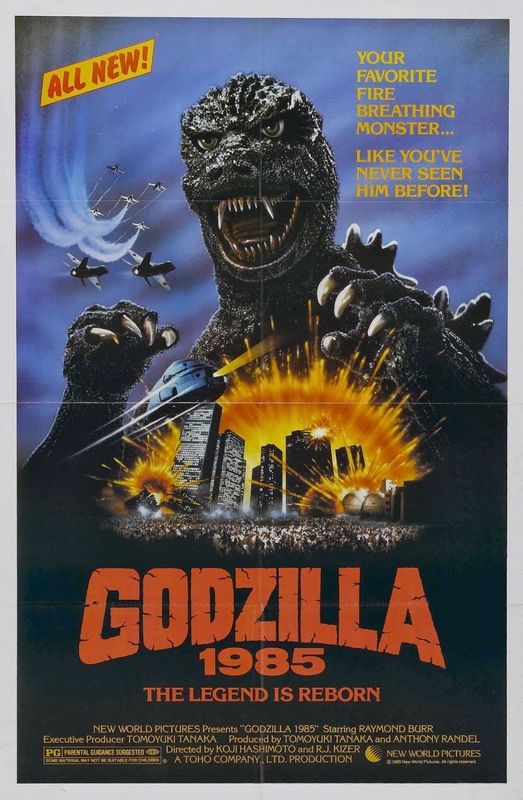 The movie opens up immediately after the events of The Return of Godzilla. A science team is digging through rubble ,and discovers a sample of Godzilla's skin. The team packs it up for research but is soon attacked by an assassin who steals it ,and escapes the site. This issue starts off right where issue #4 left off. 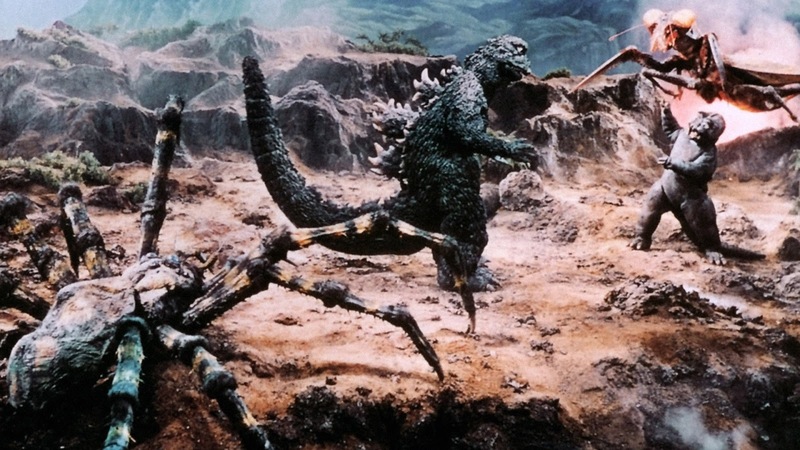 Varan is chasing the science team, but then Rodan appears ,and then begins fighting with Varan. The science team gets brought to a bunker for safety but the shaking from the battle forces them to flee deeper into the bunker. During this battle one of the students falls ,and wakes up alone. The student wanders around the base ,and discovers Gaira in some sort of holding tank. The Chinese commander on base warns the student that she should not have stumbled onto this secret ,and to keep quiet about it. As soon as the commander returns the student to the professor she informs the professor that the Chinese have Gaira captive. The professor is outraged and demands an answer for the Chinese actions. It has been 59 years ,and next November will be 60! 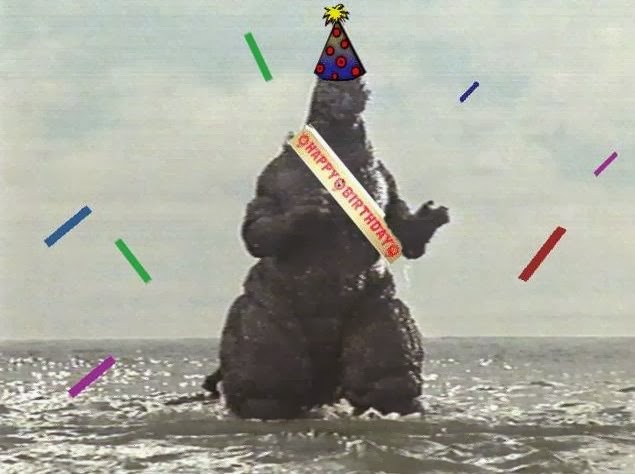 I am looking forward to another 60 years of Kaiju! Rulers of Earth Issue #4 starts off with everyone discussing the attack on the aircraft carrier from the previous issue. 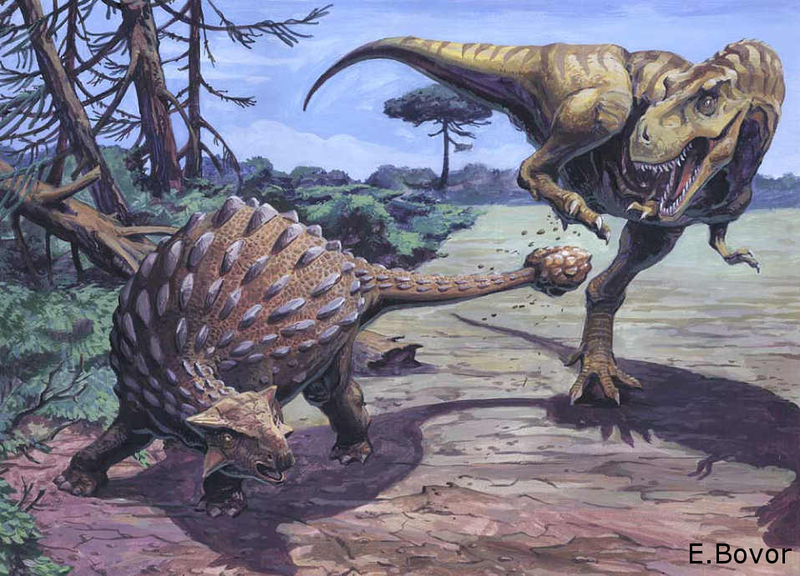 Early reports on the attack claimed it was Godzilla, but we all know it was Manda , and Gezora. The defense forces are also now aware that they are dealing with an alien situation as well. 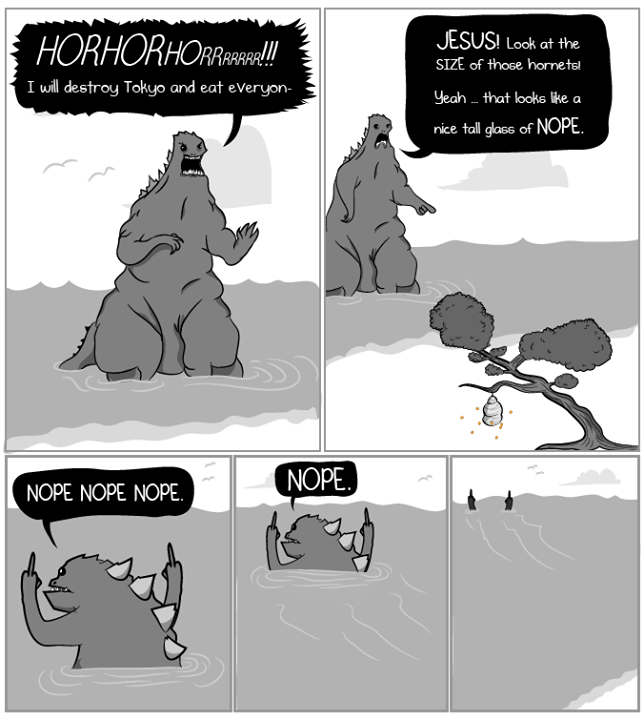 We then see Godzilla down on a beach ,and news reporters are claiming he is dead. The reports are that Godzilla came to shore and collapsed. 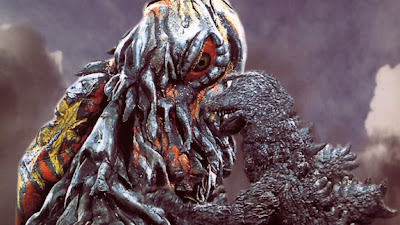 Godzilla wakes up just in time as small Destoroyah begin crawling all over him. Godzilla emits some sort of radiation burst from his body knocking all of the Destoroyah off him. A Giant Destoroyah rises from the ocean ,and the two begin battle. Meanwhile the defense forces is starting to get the idea that Godzilla is actually on their side ,and is trying to battle the other forces leading these attacks by the other Kaiju such as Zilla, Destoroyah, Manda, and Gezora. I was luck enough to attend my first Comic-Con ever this past month in New York city unfortunately Legendary wasn't there to have reveal any special Godzilla news like they did in San Diego. I did spot a few vendors selling some Godzilla things so here are a few pictures you might enjoy. This movie starts out on a fishing boat during a storm. The boat has drifted off course due to the strong current. The crew then realizes they are nearing an Island which then explodes. A loud roar is heard after these explosions. The next day a reporter is out at sea sailing on his boat when he spots the fishing boat drifting. The reporter boards the ship ,and discovers many dead crew members. The reporter then finds one crew member in a locker hiding but frozen in shock with a knife in his hand. The reporter attempts to pry the knife from the fisherman's hand as he is doing this a large beetle like creature flies down from the ceiling ,and attacks the reporter. The reporter wrestles with the creature attempting to fight it off with the knife but fails. The fisherman who was in shock comes to the reporters aid ,and kills the creature with a butchers knife. The reporter ask the fisherman what had happened on board the fishing, the fisherman reveals that the island started to move ,and that something big killed his crew members. The movie opens in the North Pole, where a Soviet fighter jet gets shot down by the Americans for not responding to them questioning why the jet was trespassing over American Territory. The crash result in an explosion setting off the bombs that the jet had onboard. The explosion then awakens the ancient Gamera. 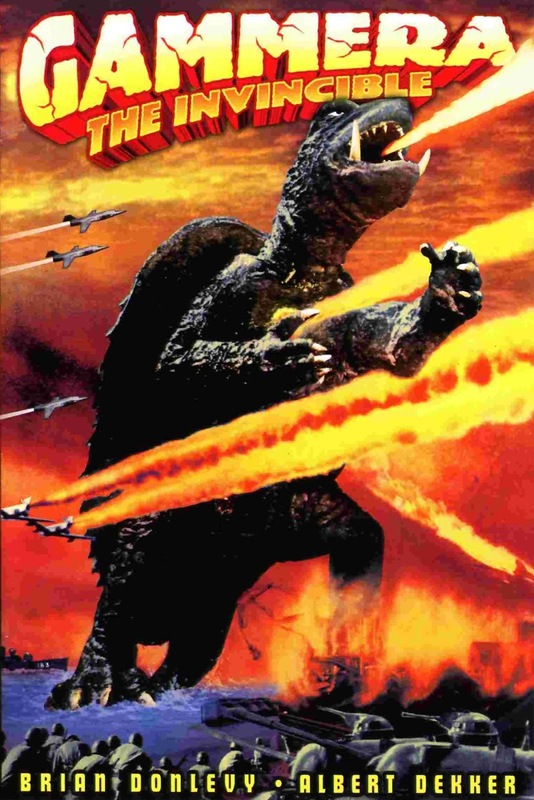 Gamera then destroys the American jets ,that shot down the Soviet jet. The Americans are unaware of Gamera's existence, so they have no clue what has just happened to their jets. Gamera disappears into the ocean leaving no evidence as to why the Americans lost their jets. 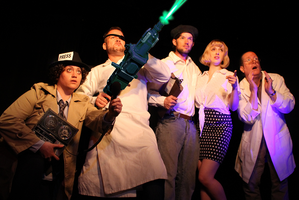 That is right Godzilla Live On Stage in San Francisco at The Dark Room Theatre. This show is a comedy that loosely follows the plot of the original Godzilla from 1954. It only cost $20 to see this show ,and if I lived in San Francisco I would totally pay that to see it. Tickets are available (Here). As a Godzilla fan I think I would really enjoy this and at $20 how can you not see this if you are a Godzilla fan in the area. The 2014 Godzilla Has Been Leaked! This picture has been circulating the web over the past week ,and many websites have taken down the picture ,after being requested to remove it. This picture was taken at a Merchandising Expo in Brazil. I am overall pretty satisfied with this being the new model of Godzilla. This model to me seems like a combination of the Heisei Godzilla mixed with Zilla. I really cannot wait to see this movie, even a trailer would make me very happy. 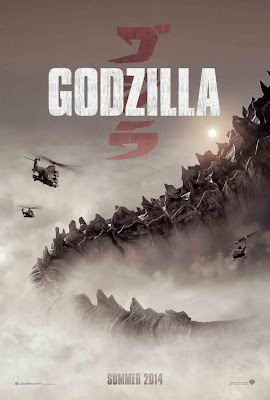 Alexandre Desplat has been selected as the composer to score the upcoming Godzilla movie,coming out in 2013. Alexandre has an endless list of movies he has scored under his belt such as, Zero Dark Thirty, Harry Potter and the Deathly Hollows Part 1 &2, The Kings Speech, The Golden Compass, and many more. I think with Alexandre's resume we are sure to have a Godzilla movie with a great score, in my opinion the score in the two Harry Potter movies were great and added a lot to them, which is why I am really looking forward to seeing what Alexandre does with Godzilla. I have been really backed up at work the last few weeks, which is why I have not had a chance to post this article. I will most likely be backed up for the next few weeks, but I will try my hardest to get some post up on the site. I have a lot of reviews that I have to do so hopefully I can get some of them posted in the next upcoming weeks. Thank you again for reading. I just started laughing when I saw this, another one of these things is not like the other scenario. 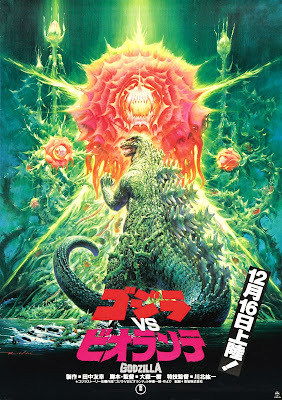 Alright today's Kaiju War Chronicles Review will be covering the battle between the infamous Zilla and Titanosaurus. This Kaiju War Chronicle was written by Forrest Freund, so props to Forrest for this awesome story I am about to cover. King Kong Live On Stage Looks Amazing! I have been hearing about this musical for awhile now ,and have been waiting to see some footage of it. I really hope that this will eventually make it to New York. I mean come on New York is a key part of King Kong it is only appropriate. This show is only being performed at the Regent Theatre, in Melbourne, Australia. I wish I could afford to go on a vacation to Australia right now. For more information on this show check out http://kingkongliveonstage.com/. Here it is the first teaser for the sequel to Gareth Edward's Monsters. This is "Monsters: Dark Continent". "How It Should Have Ended" is one of my favorite Youtube channels ,and I really enjoyed this video. Always get a good laugh from this channel. All of earth Kaiju have been collected ,and brought to an Island in the Pacific referred to as "Monsterland". Under the island is a special control center, where scientist control special functions of the island making sure that the Kaiju never leave the island ,and attack humanity. The island has all sorts of barriers keeping the monsters on the island, such as gases to make the monsters retreat back to the island , and an invisible wall that Rodan can not fly through. In the opening of the movie we see all the monsters that inhabit Monsterland, Mothra, Godzilla, Minilla, Manda, Rodan, Anguirus, Gorosaurus, Kumonga, Baragon, and Varan. On the island the scientist study these Kaiju in their natural habitat in order to learn more about them ,and how they think. One day Monsterland is attacked, we see the underground control center begins fill with a yellow gas while the scientist panic with no way of escape. "Thanks so much for your interest in Godzilla the animated series! Unfortunately at the moment we have no plans to release the 2nd season on DVD but things could change at any point and I will let you know if I hear of anything. In the meantime I did see there were lots of Godzilla animated season 2 on YouTube in case you wanted to at least get to see it." Well it is indeed unfortunate, but like he said lots of the series are available on YouTube. 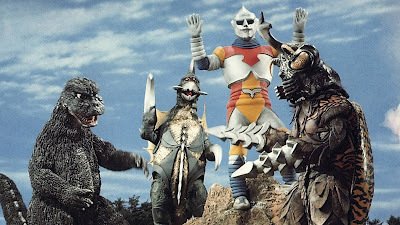 I do hope that the second season does make it to DVD ,because it would be a great addition to any Kaiju fan's collection. I thanked the Coordinator for his response ,and followed up by asking if Classic Media has plans to release any other Toho films or T.V. shows on DVD. So hopefully I will get a response with some good information. I just finished watching Godzilla vs The Sea Monster(Ebirah, Horror of the Deep) ,and that was a great flashback to my childhood. I have not seen that movie in so long, I can't even remember when it was that I saw it last. 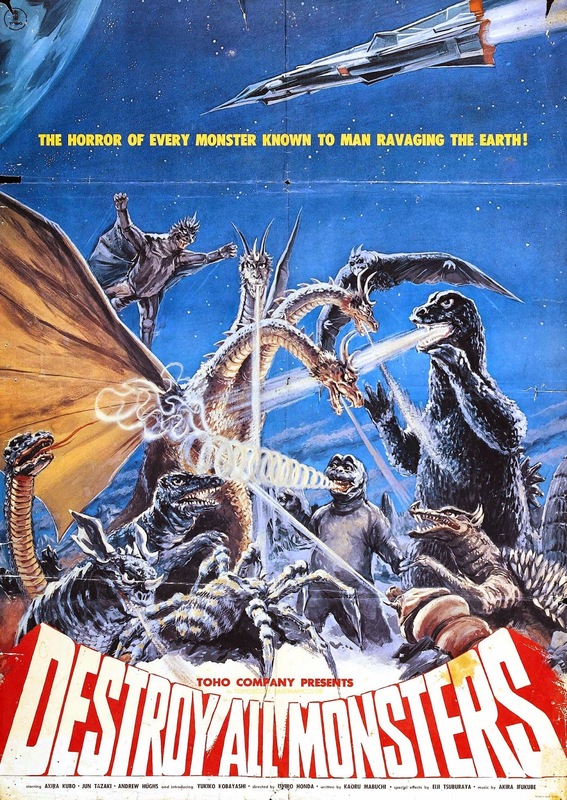 After watching that tonight, it grows my list of movie reviews I need to write to four, so expect to see a Destroy All Monsters review tomorrow night! A Thank You To World War Kaiju! 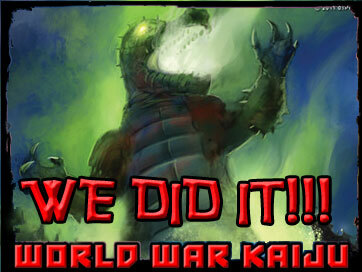 I just wanted to make this post as a thank you to everyone working on World War Kaiju. I really appreciate all your work ,and want to thank you so much for featuring my article on your website. 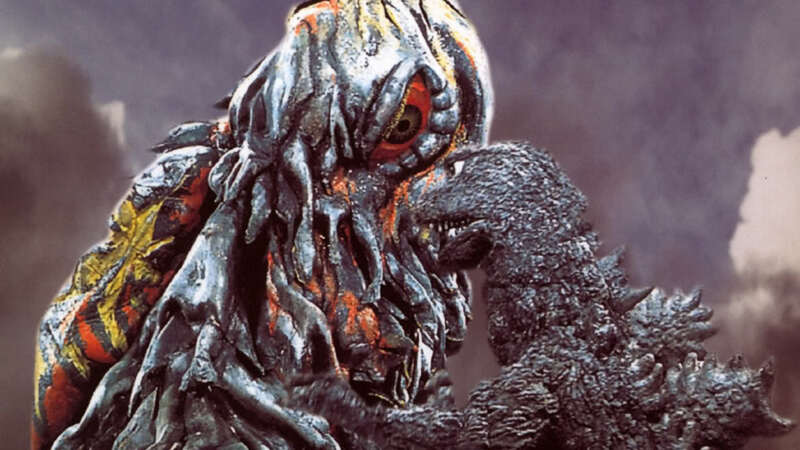 I may be far from a good writer but I do these articles for, fun out of my love ,and passion of all things Kaiju related. When I see people enjoying my views ,and opinions in my articles it brings me great joy ,and seeing that you guys enjoyed my article enough to feature it on your website sharing it with your supporters made my week. 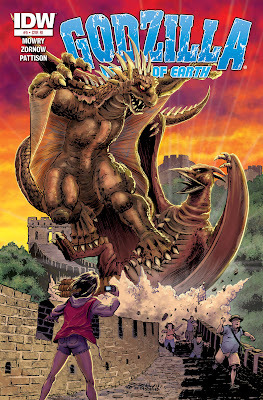 Once again thank you World War Kaiju, I look forward to reading your novel ,and featuring a review of it on my website. Good luck and may your novel be a great success! This is a new piece that I will be featuring on Godzilla Island. I will be discussing episodes of Godzilla Animated series from the '70s, as well as episodes from the later series from the '90s. 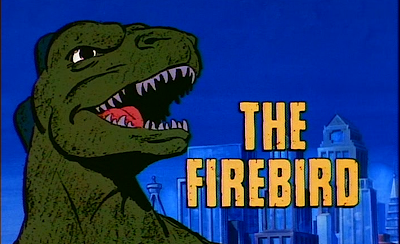 This article is about episode 1 titled "The Firebird" from the '70s series. The '70s series follows the crew of the Calico a research ship. The Calico's crew members are Captain Carl Majors, Dr. Quinn Darien, her nephew Pete, and her research assistant Brock. The crew also has Godzooky, who is Godzilla's goofy cousin, that is much smaller than him ,and has little wing flaps under his arms. Godzooky to me is like the Scooby-Doo of this gang, he can't talk but he is Pete's best friend. Captain Carl has a device that calls the final member of the Calico's team Godzilla. Now that I have gave you a little background of the show lets get into the first episode "The Firebird". 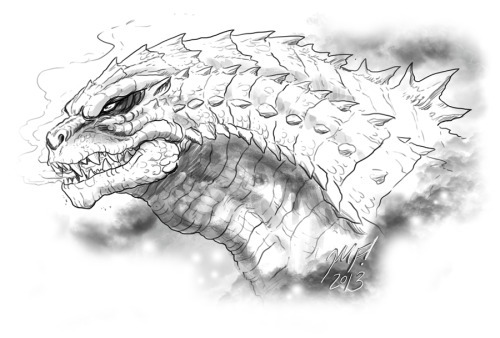 Today I am covering the Kaiju War Chronicle Gorosaurus vs Kumonga (Click for Chronicle Story) by James Webster. This story had very surprising ending ,and I really enjoyed this story because I feel Gorosaurus is a Kaiju that never really got much attention. The movie opens with a boy named Ken playing with his Godzilla toy, when a fisherman arrives at his house to see Ken's father Dr. Yano. The fisherman shows a strange dead fish that he found. The fish is black and resembles a tadpole, but it is not a tadpole. We then see on Dr. Yano's T.V. a monster has sunk an oil tanker ,and several other ships. Dr. Yano and Ken then head down to the bay where the fisherman found the strange fish. Dr. Yano goes in the bay with scuba gear and Ken stays on shore as a look out for him. While Dr. Yano is underwater Ken spots Hedorah the monster that attacked the ships. Hedorah begins swimming to shore towards Ken. Hedorah leaps out of the water towards Ken, but he leaps over Ken and gets cut by Ken's knife. Hedorah returns to the ocean where Dr. Yano is still investigating. Ken standing on shore begins to call out for his father to come back to shore, but Dr. Yano is to deep and unaware of the events that had just took place on the surfave. Dr. Yano spots Hedorah, but it is to late for him, and he gets attacked. Ken stands on the shore continuing to call for his father, and begging for his dad to come back, the scene ends leaving all viewers thinking that young Ken was left standing on shore while his dad was killed at the bottom of the ocean. 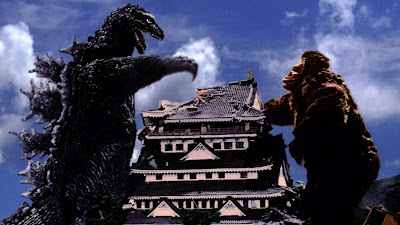 The Plot: King Kong and Godzilla return to battle each other once again. Yes that is all the plot is or about as far as this idea got to having a plot. This is a new feature where I will be discussing the Kaiju War Chronicles from tohokingdom.com. Toho Kingdom is one of my favorite websites for Kaiju information. The Kaiju War Chronicles are fan fiction stories that revolve around fights between famous Kaiju. This article is covering King Kong Vs. SpaceGodzilla by Christian Salabert story located here. Godzilla Rulers of Earth #2 has been out a week now and here is my review. The book continues where we left of last time Godzilla and Zilla are battling in Hawaii. We learn about the human characters a little more we learn about a soldier that goes by the name Chavez. Chavez lost his family in a Godzilla attack, and took down three Kaiju piloting an unnamed Giant Robot with a little girl as his co-pilot. The only clue we can get on the robot is seen on his report but we do not see the full name it says "piloting O.O.C. Mecha.." it cuts off at the "Mecha" we can only assume Mechagodzilla. We are also introduced to Professor Kenji a Kaiju expert that is assembling a team of Kaiju experts. Professor Kenji recruits Lucy Casprell the female character from the previous issue. We do not get a great explanation on what the team will be doing but I am sure it will be something interesting. The movie opens with a crew flying over the ocean and their flight equipment is receiving some sort of interference they say resembles a brain wave, but they can't figure out where it is from, they then Godzilla in the ocean and they change course. They say that the interference is not Godzilla and the navigator gets out a map to figure out where the interference is coming from they discover it is coming from a strange Island called Sollgel Island. Set Your DVR! 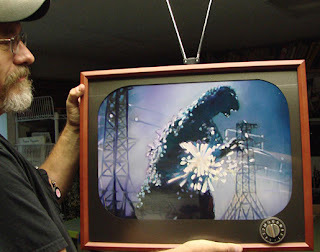 Kaiju Movies on T.V. This Month. Godzilla Fan Made Radioactive Imagine Dragons Music Video Done Right! Hey everyone I figured I would through this picture up I found on reddit the other day thought it was funny. I will be leaving Sunday for an 8 day out of country vacation so I will not be updating the page until August 5th or 6th most likely I might throw something up on the page tomorrow but I am not sure I have to see how busy I will be getting ready. Thanks for reading everyone I will be back soon with more reviews and news! Source link is here. 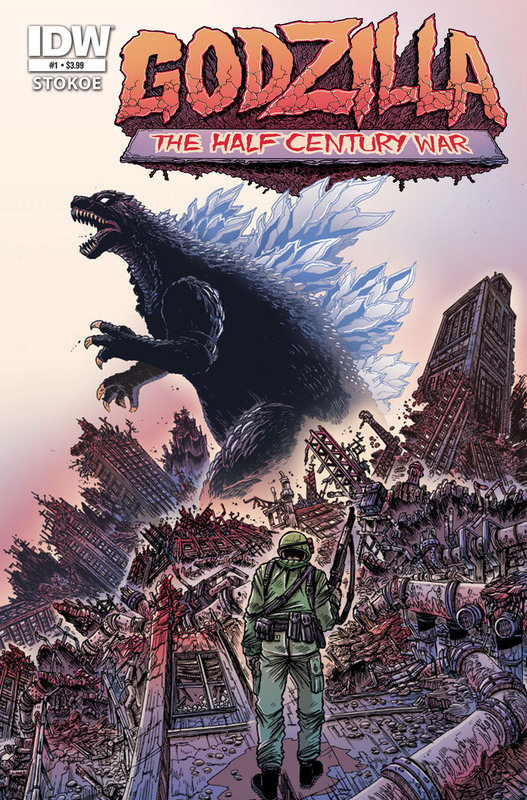 This comic series follows two members of a Japanese tank battalion turned Godzilla specialist named Ota Murakami and Kentaro Yoshihara. 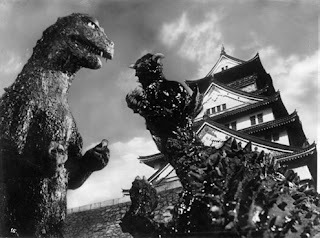 The book tells the history of Godzilla from Ota's perspective across a 50 year time span. The book starts off in 1954 with Ota and Kentaro being called into Tokyo with the army they are unsure of what is going on they were just told there has been a natural disaster they are patrolling the streets when building is hit with a fire blast and explodes they are unsure of what just happened and proceed with caution then a giant foot steps out from behind a building it is Godzilla. Ota and Kentaro's whole tank battalion gets wiped out by Godzilla and only their tank remains Godzilla then begins moving towards the evacuation point where all the unarmed civilians are located. 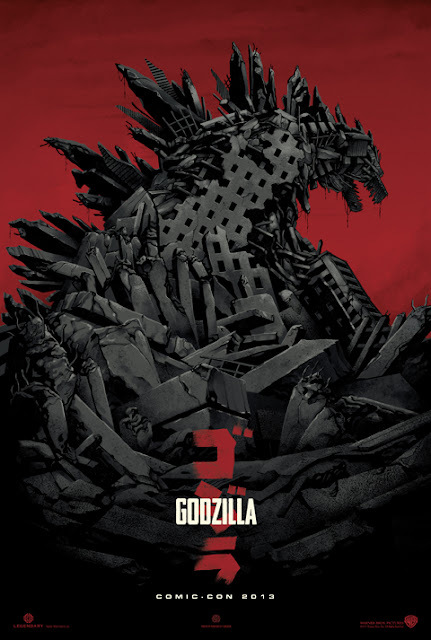 Knowing that they have the last tank available Ota and Kentaro begin firing on Godzilla with their tank to get his attention Godzilla then begins to pursuit them through the city as Kentaro races the tank through the city Ota guides him through the city, once the civilians are safely evacuated artillery support is sent in and the two manage to escape Godzilla and the artillery blast. The two were then brought two the hospital for treatment to minor wounds and managed to get out in time to watch the Navy track down Godzilla and defeat him in the bay with a new secret weapon. Godzilla Encounter Latest Updates and Translations Gallery. Here is a Gallery of some of the latest Godzilla Encounter post. This time we see pictures from the actual Comic-Con encounter, we also see more timeline post and quotes. The movie opens up with a T.V show discussion about a rare berry with many medicinal purposes that is located on Faro Island a remote Island located in the Pacific. The owner of the Pharmaceutical company Mr. Tako that distributes the berry medicine hears that natives on Faro Island worship a Giant Monster God. Mr. Tako frustrated with the poor rating and views of the T.V. Show his company sponsors demands that he have his own monster to boost ratings so he sends two men to go get him his monster. Two pilots named Tsukioka and Kobayashi have the jobs of flying low across the sea in order to spot schools of tuna for fishermen to catch for their tuna fish company. While on a search Kobayashi nears Iwato Island (a small Island formed from a volcanic eruption) his plane breaks down and he is forced to land in the shallow water of the Iwato Island. Tsukioka lands and is relieved to see that Kobayashi is safe while helping Kobayashi back to the plane they hear roars and than two Kaiju appear and begin fighting they recognize Godzilla and flee. New Godzilla 2014 Leaked GiF from Encounter! Well here it is what all the fans wanted to see thanks to a link from Godzilla-movies.com. I am very happy about this and this has to be the real deal since the video it was taken from has been flagged and taken down by Warner Bros. I just finished watching Son of Godzilla and was just hopping on my computer to write my Godzilla Raids Again blog but this has me so excited!!! I just saw the live video with sound absolutely amazing! Don't know how long the video will be available for so check the link. Reporter Steve Martin is on his way to Cairo when he stops over in Japan when he lands he is questioned by local authorities and asked if he saw anything suspicious while flying. He says no ask why they asked. Apparently the course the plane flew would of took them of the wreckage of a ship that was attacked by an unknown force and they wanted to know if he saw anything. The new of the mysteriously sunken ships gains Steve Martin's interest so he decides to hang around Japan instead and report on the ships. Ships from Japan continue to be attacked with claims of a light underwater, sudden fire every where and the ships are sunk in at impossible speeds with no survivors. Finally a ship wreck survivor washes ashore on a small inhabited native island. Steve Martin flies to the Island immediately and discovers that the island natives believe that it is an underwater god that is sinking the ships. Steve calls his reporting agency and tells them of the god attacking the ships and the news agency tells him to stay with the possibility of a monster being responsible for these attacks. That night on the island a house gets crushed by something big and the next day a paleontologist arrives to investigate there is a massive foot print in the rubble and high radiation readings. Steve and the natives set out on the island to look for the monster the natives call Godzilla while searching Godzilla rises above the mountains Steve and the natives flee. It is no apparent that the monster Godzilla is real and Steve rushes back to Tokyo. 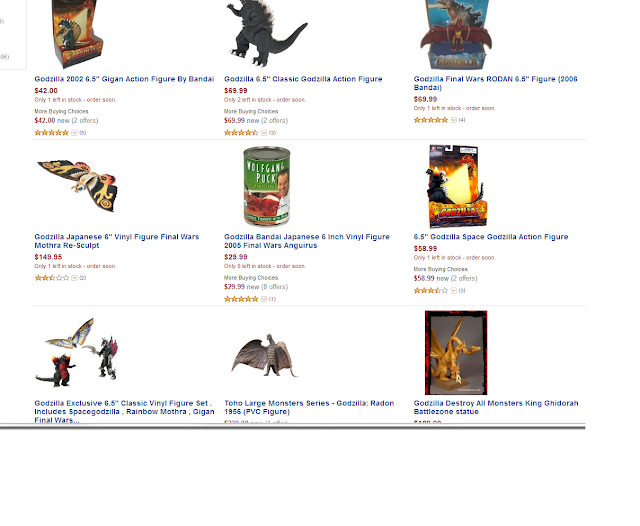 A Big Let Down for Godzilla Fans Who Did Not Make it to Comic-Con. Well all us fans that did not make it to Comic-Con are very disappointed. 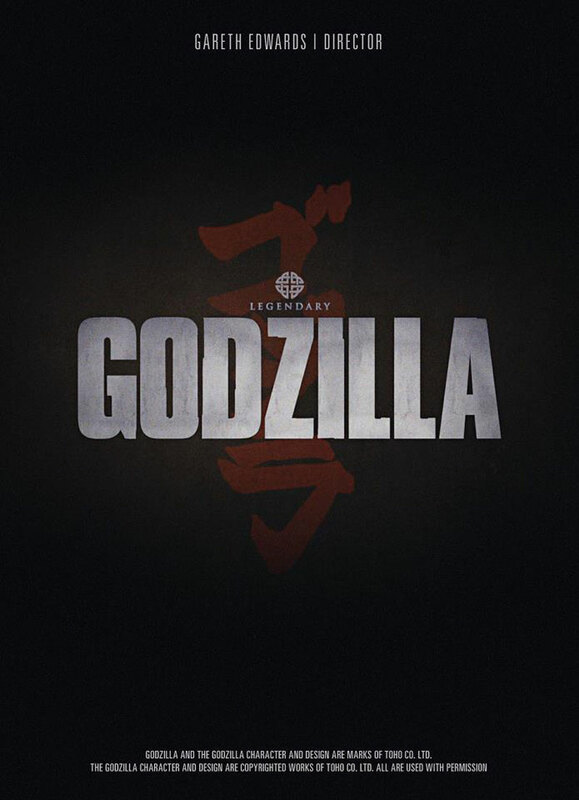 I sat at my computer yesterday watching live blogs of the Comic-Con and know a trailer was shown to the fans there but the trailer was not released to the public online just yet, so many Godzilla fans around the world had to let it sit in after months of waiting that they will have to wait a little longer to see the footage. Now we did not come away that empty handed we do know that the trailer involved some sort of giant insect, now was it a new Kaiju? 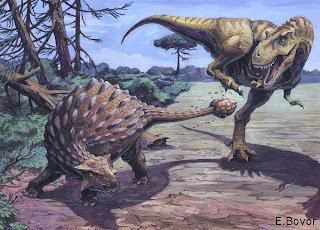 or was it Kamacaurs, Kumonga, or Meganulon? From the discription I read the bug creature seemed large but than Godzilla's foot came on screen and then the insect Kaiju's size was nothing compared to Godzilla. I did not include Megalon in the list of insect Kaiju because if it was Megalon he would be about equal in size to Godzilla so I went with the Kaiju Insects that tend to run a smaller size. Other than the insect thing there really was not much that we got to see, so now we can just wait and see what is next. This will be a new feature that you will be seeing regularly on GodzillaIsland.com. 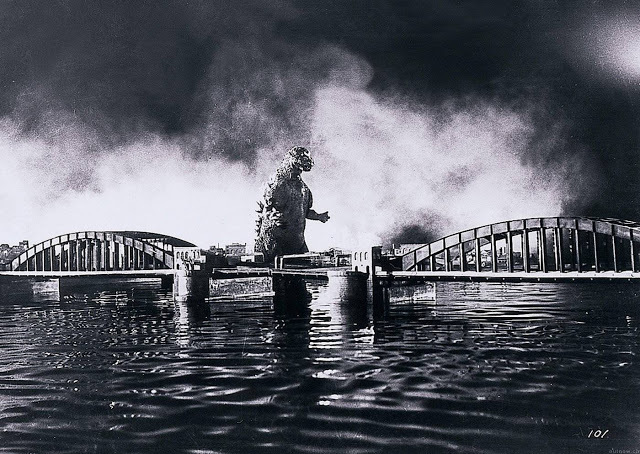 I will be discussing movies from Toho's "Lost Projects" list. 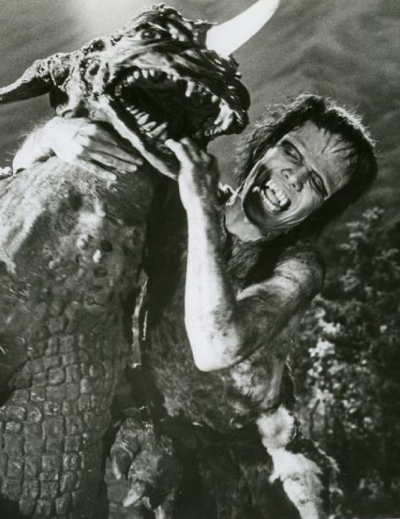 Many of the films on this list are early scripts of movies that were re-written and latter became movies that all Kaiju fans have grown to love, but some movies on this list have never had the opportunity to be re-written and make it to screen. I will be discussing all of the movies from this list and the articles will be in the same format as my reviews I will tell the plot of the movie first and then provide my thoughts on what could have been. First let us start with The Volcano Monsters which was later turned into Godzilla Raids Again. The movie opens with Nuclear testing in the ocean. 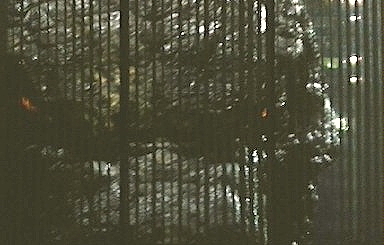 We then see Anguirus and Godzilla on monster island caught in clouds of radiation and pollution from the testing. The movie then cuts to Seatopia where the people of Seatopians are angered because the testing has begun to harm their home deep underwater in Seatopia. They say that they are going to war with the people on the surface of earth and then rise up to once again inhabit the surface. We then see an inventor named Goro out with his nephew Rokuro and his friend Hiroshi. Rokuro is riding a fish shaped boat most likely made by Goro. The lake which Rokuro is ridding on begins to get rough and an earthquake occurs Goro and Hiroshi quickly pull Rokuro in to land and watch as the Seatopians drain the lake. Over the last few days there have been some more Godzilla Encounter updates at godzillaencounter.com. Here they are 3 of the pictures are translated posters screen captured from the Godzilla app. A lot of the recent post are mainly a time line that tell the history of Godzilla's uprising. The Terror of Tokyo post makes me think that we will see Anguirus in the 2014 movie since it is referencing the battle from Godzilla Raid's Again maybe in a flashback? There is also another post that references King Kong vs Godzilla which is very interesting because Universal recently acquired Legendary who as we all know is making Godzilla 2014 but Universal owns the rights for King Kong...possible Godzilla vs King Kong rematch being teased? If so I would like it with Godzilla winning this time. Also King Ghidorah is mentioned twice who is the monster I really want Godzilla to face in 2014 but I really doubt that they would use Ghidorah for a reboot I think they will use a new enemy. 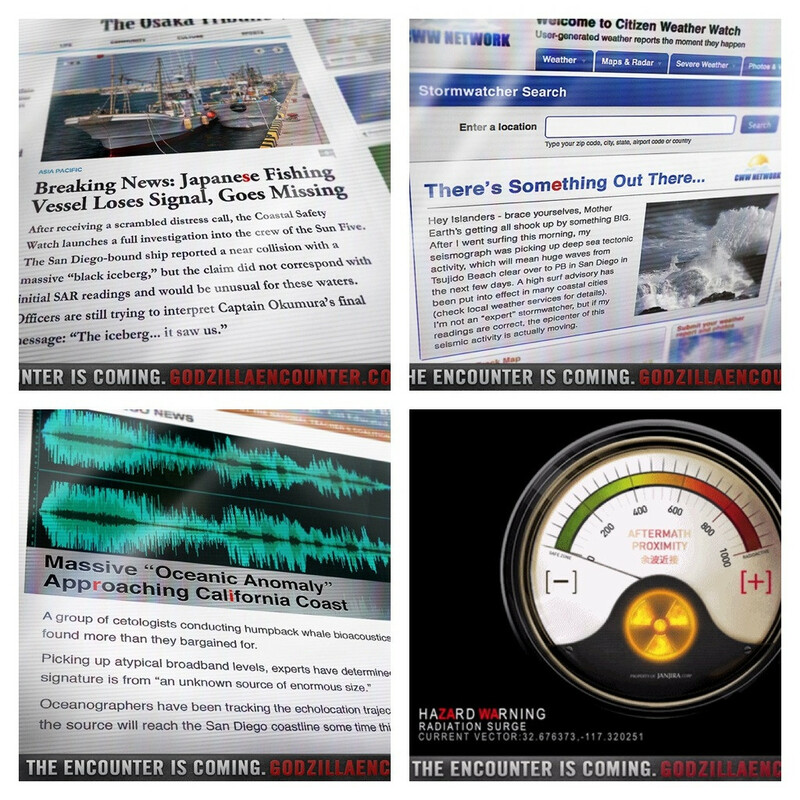 What more will be revealed tomorrow on the Godzilla Encounter site? A lot of fans are waiting and hopping to see a trailer reveal tomorrow at the Godzilla Panel at Comic-Con. We can only hope. All pictures after the break enjoy. So I stumbled across this trailer today for this new mobile game called Colossatron: Massive World Threat. This game is not out yet but the trailer looks awesome it is about a giant robot snake thing that crashes to earth and from what I tell you play as it and level cities and destroy tanks and what not. This looks like an interesting Kaiju type game. This movie follows a young boy with a big imagination named Ichiro. The movie starts off with Ichiro walking home from school with his friend Sachiko. While walking home Ichiro and Sachiko encounter a bully named Sancho. Sancho and his gang of bullies harass Ichiro and Sachiko. Ichiro heads home where he spends most of his time by himself since his parents are always working late. Ichiro is a lonely child so he takes out his radio and tries to contact Monster Island. Ichiro falls asleep and begins dreaming he is on a plane to Monster Island. Ichiro arrives on the Island he wanders around the Island and sees many Kaiju such as Anguirus, Gorosaurus, and Manda. Ichiro then finds Godzilla fighting three Kamacuras. Godzilla quickly defeats the Kamacuras but one of the remaining Kamacuras strays off and spots Ichiro. Ichiro runs away from it but falls down a deep tunnel, while Ichiro tries to climb out a rope is lowered down into the tunnel Ichiro grabs on and gets pulled up. Ichiro discovers it was Minilla(the son of Godzilla) that pulled him up. Minilla can talk and is just a little taller than Ichiro. 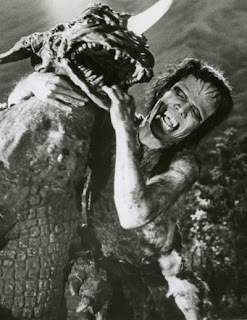 Minilla reveals to Ichiro that he has a bully himself a monster named Gabara. Ichiro is then woken up by the toy maker that lives in the appartment bellow him, the toy maker informs Ichiro that his mother is working late and the Ichiro will have to be alone for the rest of the night. Here is some footage from the SDCC Godzilla Encounter looks really fun! Wish I was there! New Godzilla 2014 Poster Revealed! Here it is the new poster revealed today at Comic-Con. Today was a pretty good day on the Godzilla news front we got to see quite a bit of the Godzilla Encounter, now lets hope Saturday at the Godzilla Panel we get a peak at a Trailer! The panel is this Saturday at 10:45 AM PST. As you can tell this reviews arrangement is a little bit different than my regular reviews, normally I give a detailed summary of the plot, but since this is a new movie I do not want to spoil it for everyone so I will save the spoilers for after the break. So my thoughts on this movie........it was DAMN AMAZING!!! Easily the best movie I have seen in along time the last time I felt the way I did coming out of this movie was when I saw Dark Knight Rises. I got out of the theatre and wanted to run right back in and watch it again immediately, it was that good! The fight scenes were awesome! The 3D actually the nicest I have seen in a movie I still think , 3D is unnecessary and gimmicky but hey it actually added to the movie a little for once. 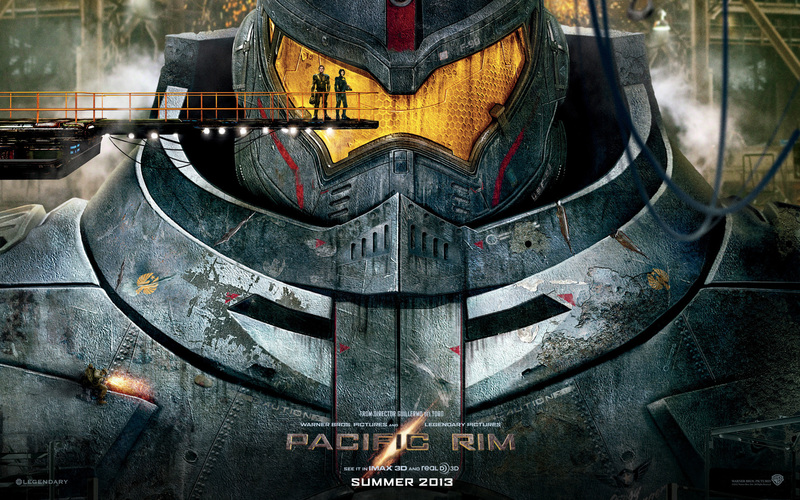 I was lucky enough to have an IMAX theatre near by me to see this movie and enjoy the explosions and see the Jaegers and Kaijus in the massive size they were meant to be seen. The story was pretty cool and interesting especially since it took place in the very near future (2020's). The characters were great especially Charlie Day from Always Sunny he was hysterical. 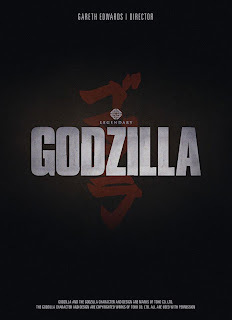 I was very happy that they paid tribute to Ishiro Honda, and they also had a little easter egg in naming the Kaiju rating system the "Serizawa Scale" a little homage to Godzilla. The movie does end with a little after credits easter egg a "rumble" others claim it is a roar I say it is more of a rumble or growl, not really worth sitting through the whole credits for I got lucky and caught the end of the credits from the previous showing when I got in the theatre, if you are going to wait for anything wait for the short little scene in the middle of the credits and leave after that like I said it is just a rumble and a black screen. So if you have not seen this movie go see it! Alright so a bunch of Images have already made it to the web from the Godzilla encounter exhibit. I am not sure if any of these are the final model of Godzilla but we can see that Legendary went in the right direction with what he looks like. Their seems to be multiple models of different Godzilla builds but no reports on any other monsters yet. The only mention I have seen of other monsters is on the menu we see Biollante, Ghidorah, Ebirah, Anguirus,Kumonga, Zilla, and a mention of a Mecha. But those mentions are just on a restaurant menu so I would not look in to it to much. I am pretty happy with what I am seeing. More Godzilla pictures after the break and even more here. Today is the big day the Godzilla Encounter at SDCC is now open lots of news will be flying in I will try and keep everyone updated but I am at work so might be a little a little delayed. Well here is some concept art up top. 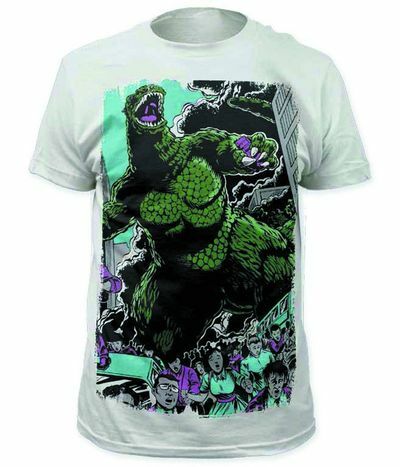 Godzilla 2014 T-Shirts Are Now Available Online! 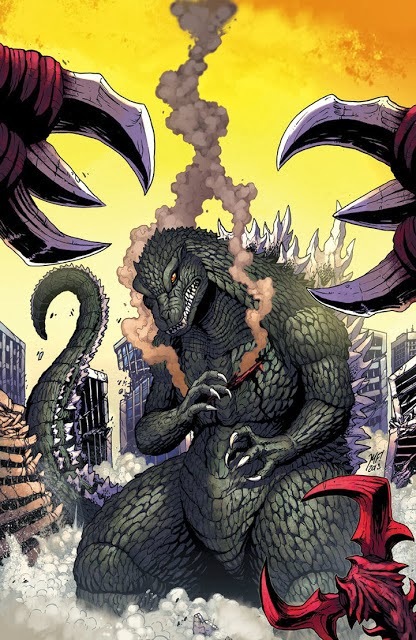 I just finished reading Issue #1 of Godzilla Rulers of Earth ,and I have to say I am very impressed. Just look at the picture of this cover it is just so badass! The artwork is great, the little Easter eggs that they hide in the pictures are awesome, this comic just continued to impress. This is the first Godzilla comic series I have read, I did own a few of the old old....really old comic books but I do not really remember them, and I am not sure if I even still have them. This first book gives me high hopes though for the series. Godzilla Encounter App Available to Download! 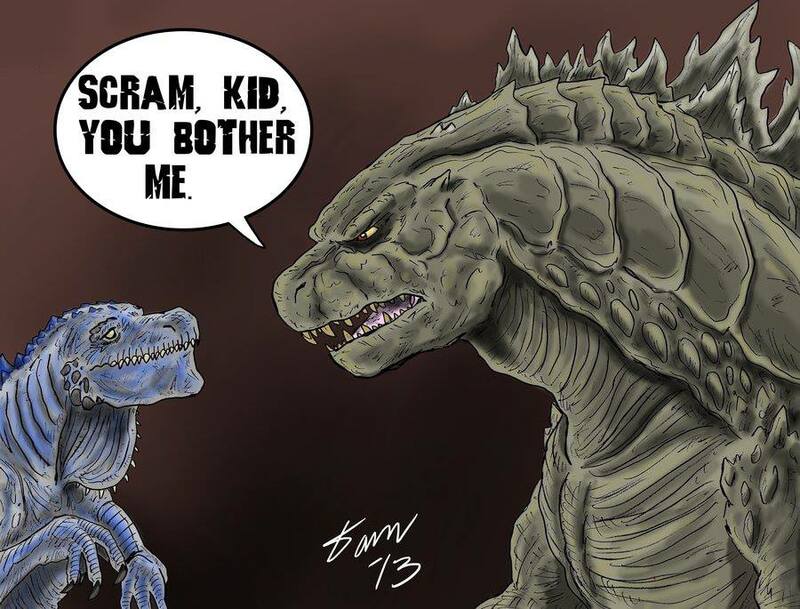 Thought all you Godzilla fans might enjoy this, it gave me a laugh. This secret was discovered on /r/Godzilla if you put all the red letters together from the first Godzilla Encounter post to the most recent they spell out "Serizawa" as in Dr. Serizawa from the Orginal 1954 Godzilla. Dr. Serizawa is known for creating the oxygen destroyer which defeats Godzilla in the first movie. The secret message is to gain access to tickets for the Godzilla Encounter at comic-con here use "Serizawa" as the code to unlock the tickets. With the mention of Serizawa does this mean Godzilla won't be surviving his big return to the big screen or will Destroyah be one of the monsters Godzilla will be fighting? Maybe the oxygen destroyer will create Destroyah during a test run, who knows? But I really hope we don't see Godzilla's death in this movie. Another Godzilla Encounter Update Posted! Here is another Godzilla Encounter update posted today on Godzillaencounter.com. Godzilla is getting closer!! I will continue to keep you posted on these updates! 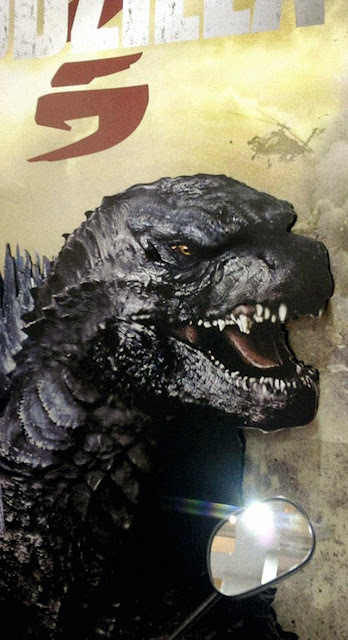 Gareth Edwards shows a Comic-Con Godzilla Poster! I mean look how badass this poster is how can you now be excited to hear what will be announced this week at Comic-Con. Man I wish I lived in San Diego. 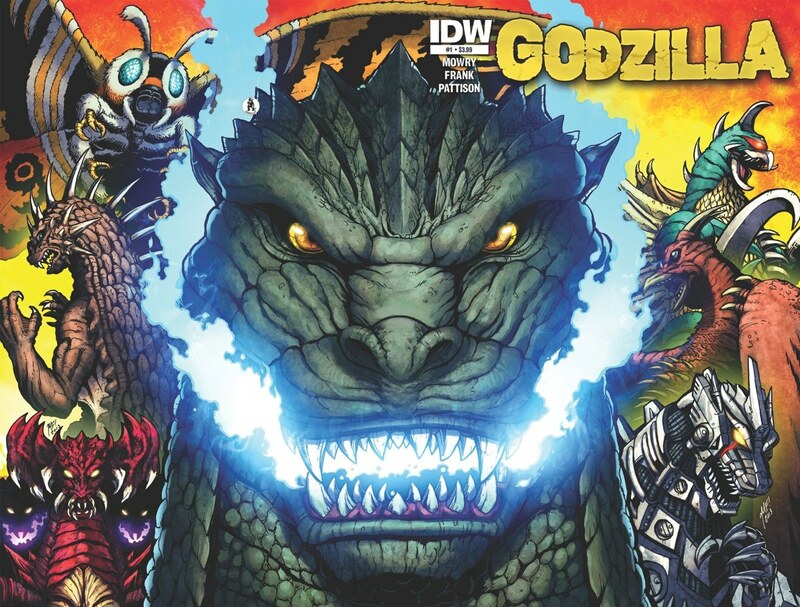 I will be going to the NYC Comic-Con so I can only hope their is some Godzilla news for me to cover there.